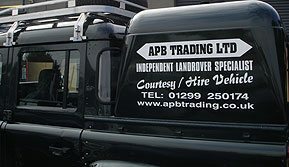 As a genuine enthusiast, Managing Director of APB Trading Ltd., Phillip Bond, has amassed a wealth of knowledge and experience in Land Rovers and assembled a professional team whose combined years of experience puts APB ahead of the competition as Land Rover and 4x4 specialists with a top quality 4x4 sevice centre for all 4x4 repair, 4x4 servicing, 4x4 tyres, Land Rover servicing & Land Rover Parts. Why not contact us today for a 4x4 service cost quotation. APB’s workshops are fully equipped with the latest Autologic diagnostic equipment to carry out 4x4 servicing and maintenance on the full Land Rover range without affecting your manufacturer’s warranty. 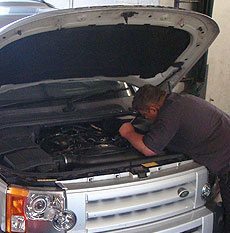 Performance tuning and power upgrades are available for most Land Rover vehicles. Not only do APB service and repair Land Rover, Range Rover, Freelander and Discovery but also most makes of off-road 4x4 vehicles to include Toyota, Mitsubishi, Daihatsu, Nissan, Pajero and Isuzu. Our experienced 4x4 mechanics can handle minor or major repairs, MOT preparation, and arrange MOT testing by appointment. The bodyshop can rectify anything from a slight scratch to serious damage. Chassis change and re-builds also available. 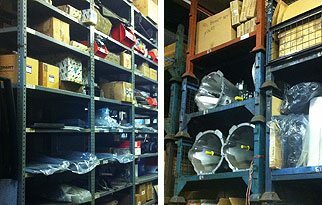 APB’s warehouse has literally thousands of parts in stock, covering all Land Rover models, right back to Series I,& II, including tyres for models of all ages. 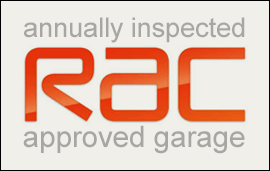 The salvage department has an extensive range of used parts for most vehicles. It is owners of older models in particular who appreciate APB’s specialist knowledge. Sourcing hard-to-find spares for veteran Land Rover vehicles is our forte. From ex-military dealers to vintage clubs and societies, we know who keeps what and where. Here at APB we have been rust-proofing customer Land Rovers and all makes of 4x4’s for over 40 years. We offer a highly comprehensive (11 litre Waxoyl) full vehicle underbody protection package. Your vehicle’s underside is ‘high pressure steam blasted’, clearing away any surface dirt/rust, and then left overnight to fully dry before sprayed Waxoyl application, to ensure a high quality corrosion protection. Chassis and door body internal injection can also be included as an extra package, to further increase your level of rust protection. Rust: The Hidden Problem – Whatever age or condition, its never to late to kill rust. Waxoyl gets too the root of the problem – Unique formula, powerful rustkiller, chases out moisture, flexible weatherproof skin, won’t crack, dry or wash off in the rain. Long Lasting Protection – prevents multi-metal corrosion and the threat of winter time salt corrosion. 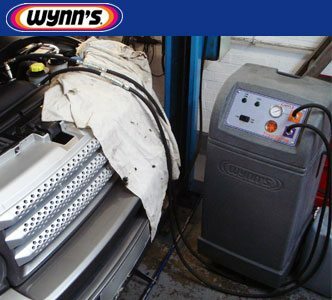 APB have the latest Wynn’s Flush system which automatically changes your auto gearbox oil by flushing the system of existing ATF and replacing the Automatic Transmission Fluid in an efficient and effective way. Direct connection to the transmission oil cooler lines. 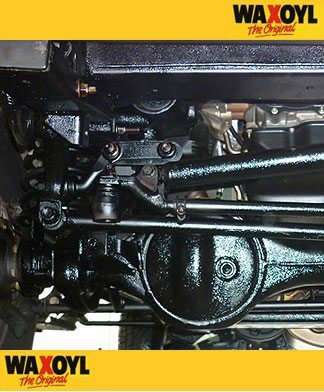 Cleans the automatic gearbox oil system with the Wynn’s Automatic Transmission Flush. Recommended when changing ATF in automatic gearboxes or when experiencing shifting problems. Recommended for all types of Automatic Land Rover and 4x4 Vehicles.